I’ve been looking for healthier recipes in the past few weeks. Green beans are one of favorite veggies — possibly my very favorite. But the canned kind have a lot of sodium, and I eat too much sodium as it is. (French fries are my second favorite vegetable.) 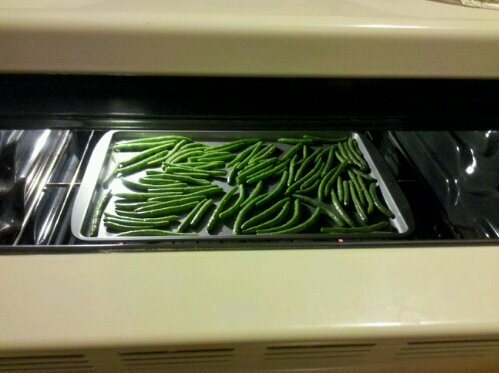 So I decided to try making roasted greens beans. Many of the roasted veggie recipes I saw on the Internets included salt; I skipped that and the results were delish. The recipe is not complicated, though I didn’t measure any of the ingredients because I don’t like to have my food creativity stifled. 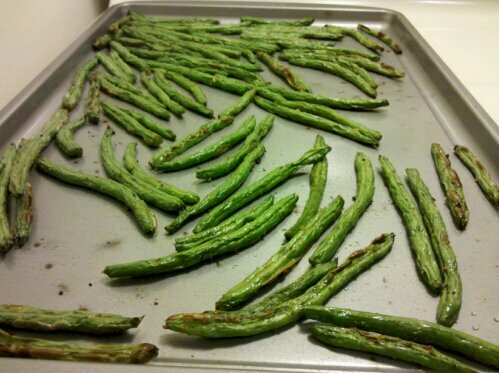 Take bunch of fresh green beans (I had about 12 ounces), drizzle a spoonful or so of olive oil on them and shuffle them around to coat them. Sprinkle the beans with toppings of some sort (I used a Mrs. Dash garlic and herb seasoning that has been chilling unused in my kitchen cabinet for a while), and shuffle them around some more to evenly distribute the seasoning. Put them in a 425 degree oven for 10 minutes, shake them around a bit so they don’t stick and put them back in the oven for five more minutes. The first time I made these, I used a lot of seasoning — perhaps too much. They were very peppery and the boyfriend was not thrilled with their serious pepperiness. (I actually rather liked them that way!) The second time, less seasoning was used and we were both happy.